Sharing a border with both Laos and Cambodia, Thailand’s northeast region is known as Isaan (Isan or Issan). This rural area is generally overlooked by most travelers which makes a visit here a great way to get well off the tourist path. Some say the Issan is the “real Thailand”, or that one has not really experienced the country without seeing the northeast. ​Three of the best known cities in northeastern Thailand are; Korat (Nakhon Ratchasima), Buriam City and Surin. All of these places are on the railway line between Bangkok and Ubon Ratchathani which makes reaching them easy and inexpensive. These are working cities that do not rely on tourism but still offer adventure travelers things to do and see. Best of all; they are within striking distance of ancient Khmer temple ruins. ​Located 37 miles (60 km) from Korat’s city center, in the town of Phimai, is Prasat Hin Phimai, Thailand’s largest Khmer-built temple. 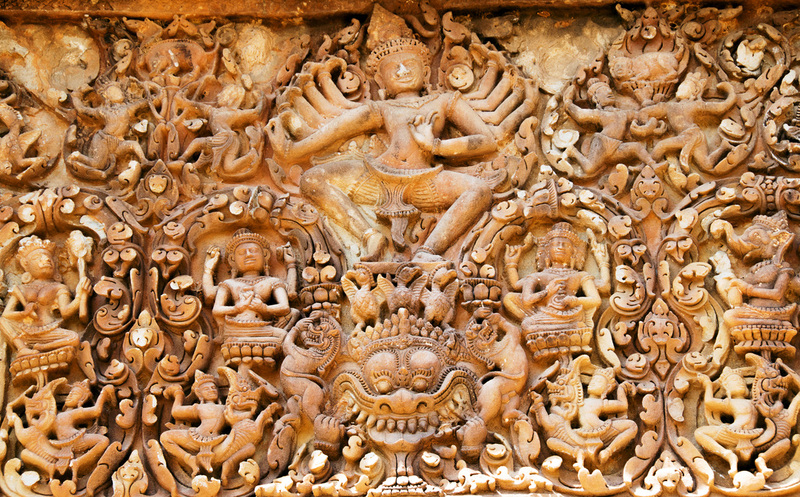 This fantastic historical site is considered to be the most important of the Thai Angkor-era temples. This is not only due to its impressive size but also its position at the end of the ancient “highway” from Angkor Wat. Also, most all of the temples built at this time (11th to 12th century) were oriented in an east to west direction. However, Phimai faces to the south, in the direction of Angkor, the former capital of the Khmer empire. After an extensive restoration project this temple is now in very nice condition and is well worth a visit. The Phimai National Museum is a ten-minute walk from the historic park. This is an excellent museum which contains many interesting artifacts recovered from Phimai. In addition to the local finds, the museum displays antiquities from a number of different areas and time periods of Thai history. It is very easy to reach Phimai from Korat by either bus or van (mini bus). Large air-conditioned city buses depart bus terminal number two approximately every 40 minutes to an hour. The fare is 50 baht and the trip takes around an hour and fifteen minutes. The Phimai historical park is less than a five minute walks from the bus stop in Phimai’s town center. Located 43 miles (70 km) south of Buriam City are the restored temple complexes of Phanom Rung and Muang Tam. Built in the 10th to 13th centuries, Phanom Rung is the larger and most impressive of the two as it sits at an elevation of 1,319 (402 m) on the rim of an extinct volcano. Muang Tam lies another 4 miles (7 km) to the south of Phanom Rung. These temples can be reached from Buriam by car or motorcycle. Most hotels can arrange tours utilizing taxis for around $50 USD. Another option is to use the town of Nang Rong as a base and take a taxi the remaining 26 miles (40 km). 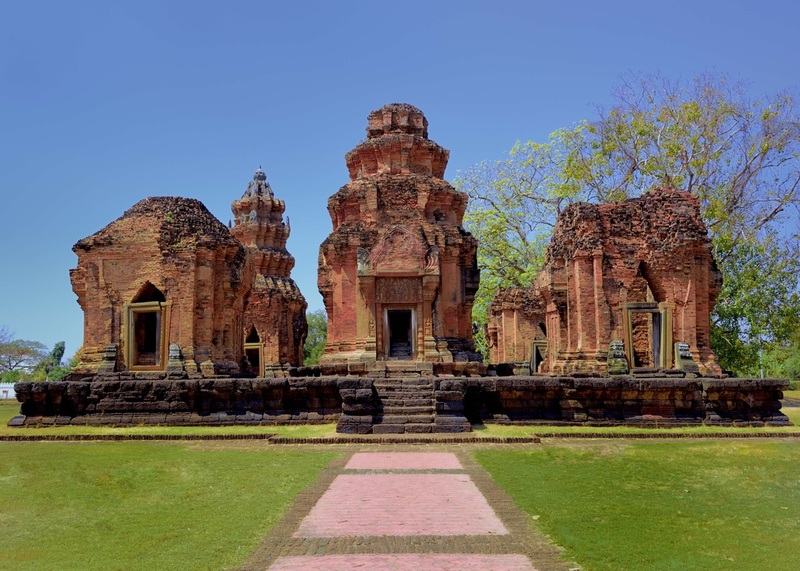 Prasat Sikhoraphum is a small temple complex built in the 11th to 12th century, located in the town of the same name. Sikhoraphum is easily reached by train from Surin, the 22 mile (35 km) trip takes approximately 40 minutes and third class tickets can be purchased for as little as 7 baht or 20 cents each way. Tuk tuks and moto taxis are available at the railway station or take a twenty-minute stroll through town, past the central market, to the temple. Another site worth visiting is the Surin National Museum. Located approximately 3 miles (5 km) from the town center, the museum features displays which recount the history of the area and its people. An emphasis is placed on explaining traditional ways of life such as farming and rice production.